Dance Marathon at CofC Raises $50K For The Kids! Music echoed through TD Arena on Saturday as College of Charleston students’ dance moves and philanthropy sent vibrations across the covered court and into children’s hospitals for the College’s annual Dance Marathon. 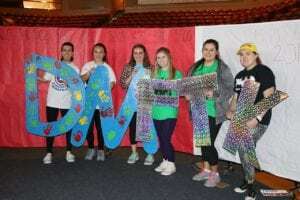 Participants in this year’s eve nt spent 13 hours on their feet beneath multicolored strobe lights and raised a grand total of $51,076.52 for the Medical University of South Carolina’s Shawn Jenkins Children Hospital and the Children’s Miracle Network hospitals. The day-long event was packed with activities and entertainment including a magic show, belly dance performance and private concert from Charleston-based band Midnight City. The participants’ most cherished aspect of the day, though, was meeting the kids. Each year, several MUSC Children’s Hospital patients and families stop by Dance Marathon to tell their stories, show their gratitude and motivate the dancers. “It’s so special to see how far they’ve come and how far they’re going to continue to go,” said Patrick Smith, a sophomore at CofC who was the special events chair for this year’s event.